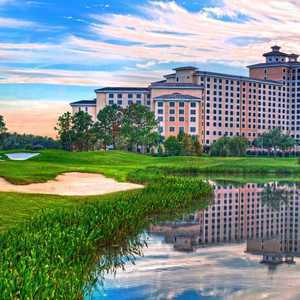 ORLANDO, Fla. -- The International Course might be widely recognized as the better of the two layouts at ChampionsGate Golf Club, but that's no reason to dismiss the National Course, which serves a different purpose. The National Course at ChampionsGate Golf Club delivers a traditional Florida test cut through former orange groves and forest. The International is ChampionsGate's grinder, a bold layout tough enough to host major events such as the Office Depot Father-Son Challenge from 2003-08, featuring legends such as Jack Nicklaus, Arnold Palmer, Greg Norman and Bernhard Langer. The 7,128-yard National is the club's more resort-friendly layout. It delivers a more traditional Florida test cut through former orange groves and forest. There are fewer bunkers and only a couple forced carries at the National. Shots can be run onto the greens from many angles. Players migrating south during the winter months tend to tackle the National as a warm-up before taking on brawnier layouts. The National's slope (138) and rating (75.2) are considerably gentler than the International (slope 143, rating 76.8). 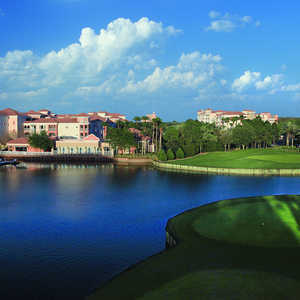 "On the International, shots are designed to run into the bunkers," ChampionsGate General Manager Alan Findlay said. "That's links golf, your ball going down the fairway and suddenly ending up in a bunker. The National doesn't collect into those areas. You've got a good chance to advance your golf ball. You don't get stuck with those tricky shots." Both ChampionsGate tracks are Norman designs that feature GPS in the carts and prime conditioning. Coupled with the wonderful four-diamond Omni Orlando Resort at ChampionsGate next door -- home to 720 rooms and suites, two- and three-bedroom villas, a European-themed spa, five restaurants, a child-friendly par 3 and 15 acres of pools, including a lazy river -- ChampionsGate is a versatile destination that can cater to golfers, families and corporate travelers. Within a half-hour's drive are the Orlando International Airport, Walt Disney World, Universal Studios and SeaWorld. Matt Culley, visiting from Boston, found the National Course to be a fair challenge. "The course is fairly straightforward," he said. "The short holes, if you miss, they will really hurt you. It's a good place to start. It's a fun course." Easier hardly means pushover. Smaller greens demand more precision. Lateral hazard wetlands, along with 80 bunkers, swallow wayward shots. The 323-yard fifth hole and the 210-yard 14th are memorable tests. The fifth feels tighter than a straightjacket as intimidating wetlands run down the entire left side of this dogleg left. Standing on the 14th tee, the green is barely visible. It appears that the flagstick is just another weed growing out of the wetlands. This hazard gobbles more than 15,000 balls a year, so choose your club wisely. Findlay said the fear of the unknown gets golfers to grip their clubs a little tighter on both holes. "Number 5 and number 14 are pivotal with what Norman was trying to do with the National Course," Findlay said. The variety of the finishing holes -- a 315-yard drivable par 4 at No. 16, a stern 636-yard par 5 at No. 17 and a gut-busting 451-yard par 4 at No. 18 -- set up a dynamite finish. Champions Tour player Andy Bean holds the course record with a 64. For those who aren't ready to shoot those kind of scores, ChampionsGate is the world headquarters of the David Leadbetter Golf Academy. Findlay said golfers love ChampionsGate because the courses are so different. "Golfers playing 36 holes can get different experiences on two types of courses," he said. "The National can be more user-friendly. When we have snowbirds, I ask them, 'Which do you prefer?' They say, 'The International beat me up, but I scored better at the National.' They like that variety."